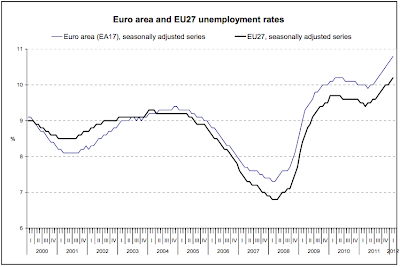 Eurostat has released data on the unemployment rate for February, and as the extracted graph above shows, the situation there continues to worsen at an unchecked pace and is now noticeably worse than at the height of the great recession. 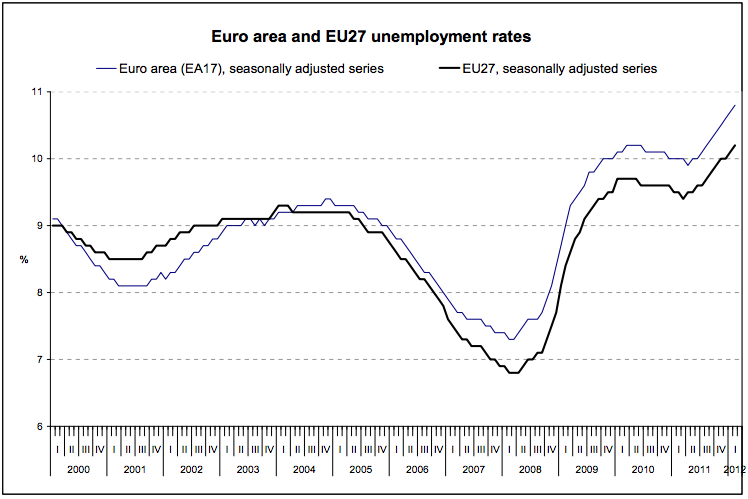 the euro area. In February 2011 it was 21.0% and 20.5% respectively. The lowest rates were observed in Germany (8.2%), Austria (8.3%) and the Netherlands (9.4%), and the highest in Spain (50.5%) and Greece (50.4% in December 2011). So more than half of Spanish and Greek under-25s are unemployed. Those countries will have serious political stability risks as long as youth unemployment is that high.